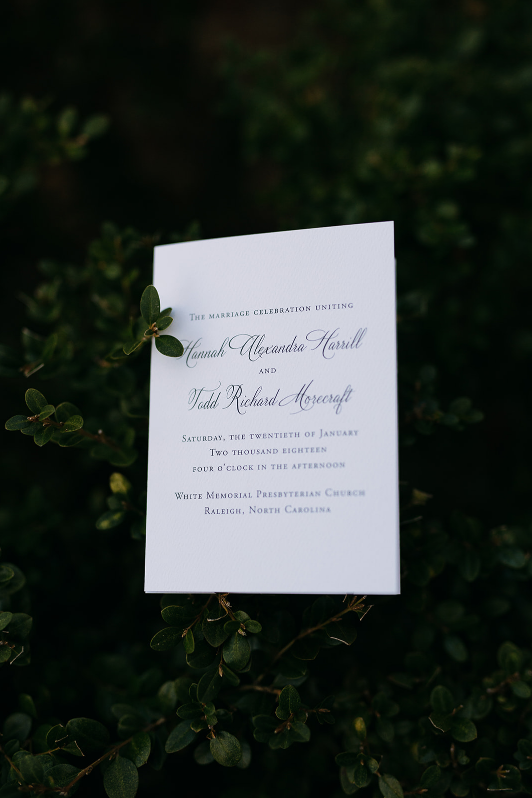 Many factors influence the cost of an invitation: What print process? How many inserts? Do you want a lined envelope? Inner and outer envelope? Is a metallic color like gold important to you, or do watercolors catch your eye? Below is a very general guideline for the cost of an invitation suite created in each of our different print processes. This price includes 100 printed invitations, envelopes, reply cards, and reply envelopes. Be sure to check out older blog posts to see the difference between the different print processes. Keep in mind that these prices are only an estimate, and will vary based on what you choose for your suite. Each print process has benefits and drawbacks and there is a time and a place we recommend each one. Stop by and flip through one of our many albums to touch and feel the difference for yourself! 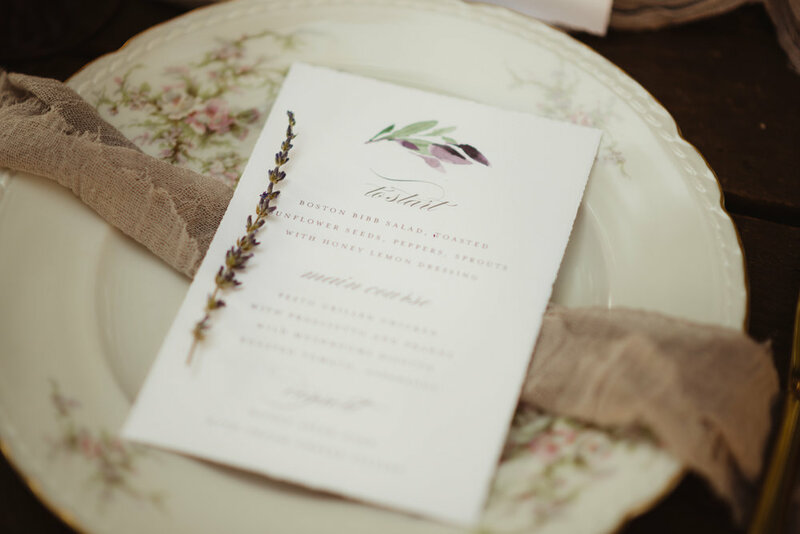 One of the biggest trends we have seen this year in the bridal industry is the use of watercolor images. Colorful flowers, whimsical brush strokes, captivating sunsets. All of these images do best when printed using a digital flat print. One of the biggest advantages of using a flat print is the ability to use multiple colors, and various shades within one color family. It is not possible to get that variety using engraving, thermography, or letterpress. Another advantage of digital printing is the cost. It is typically less expensive than other print processes. The timeline to produce a flat printed invitation is also usually shorter. Thicker papers are usually not a great option for flat print, but we have a wide selection of card stock, felted and deckled edge papers to use. Our in-house graphic design team has been bursting with beautiful designs for invitations. 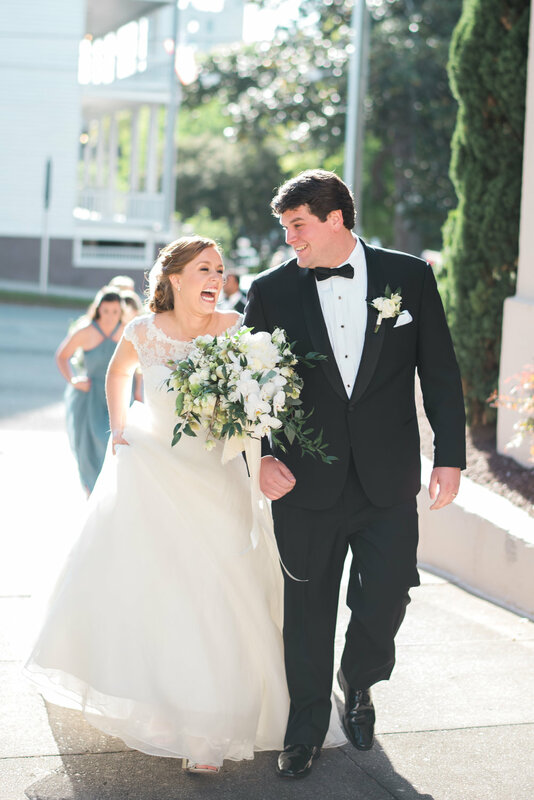 Whether for bridal showers and brunches, rehearsal dinners and welcome parties, or programs and place cards, the options are limitless! We all live in the real world (well, most of the time) and know that every occasion has its own needs. That’s true for invitations as well. Sometimes you send a text, sometimes you want a playful invitation, and other times you want a little more formality. And that same real world also comes with real budgets. Thermography is a budget-friendly alternative to engraving. Thermography produces raised ink that gives a more formal feel than flat printing. The process is not as time-consuming as engraving, allowing for the costs to come down. The invitation is printed with ink, and then a special compound is sprinkled on the invitation and heated. The powder adheres to the ink once heated, creating the raised texture. There is no bruising on the back. Certain papers are not suitable for thermography, and there are some visual differences between the inks, but it still stands as a very popular method for printing wedding invitations. It is very important for all of the bridal consultants at If It’s Paper to understand and respect the budget of every bride and groom. 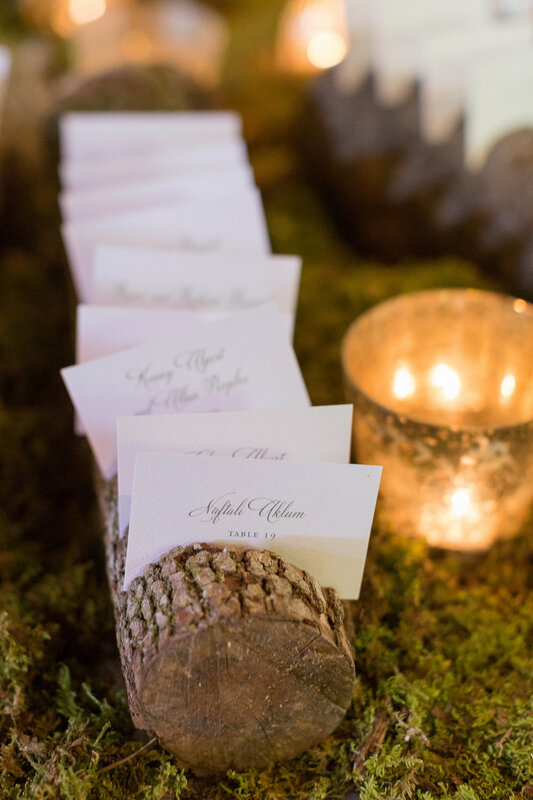 We pride ourselves in finding beautiful invitations for every event! In recent years, the art of letterpress has been revived. And we couldn’t be happier! In fact, you can often walk into one of our stores and find us swooning over a letterpressed piece of stationery or invitation. The words “to have and to hold” may refer to wedding vows, but can’t it apply to beautiful paper as well? Because we have some serious letterpress love! So what’s all the fuss about? A letterpress invitation entices multiple senses. You see it and you feel it. The process starts when the design is copied onto a polymer plate. Negative space is carved away and the plate is fed into the printing press. The ink is mixed and spread on the roller. Many designers use printing presses that are hundreds of years old. Each invitation is individually pressed into the plate. Originally, only enough pressure was applied so that the plate kissed the top of the paper leaving virtually no indentation. Today’s brides often want more pressure applied so that the texture of the paper is emphasized. Either way, the result is beautiful. 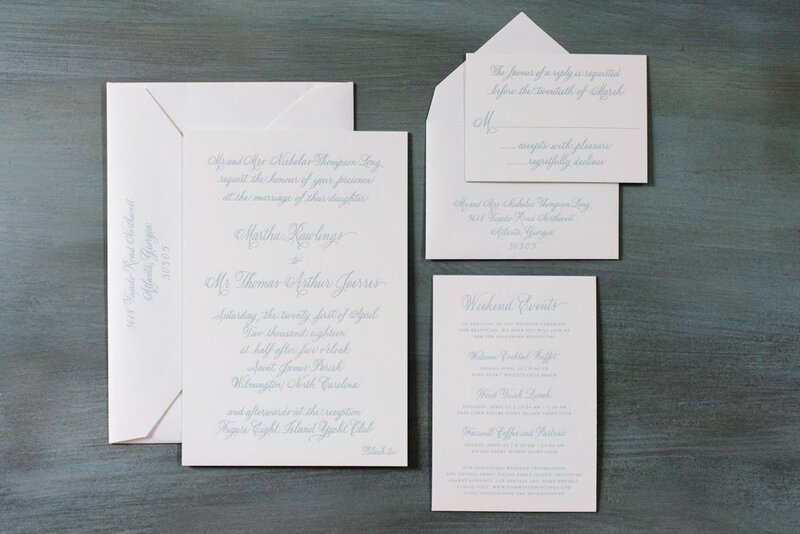 Below are some examples of letterpress invitations from our partners at Bella Figura. Feel free to swoon! And if you're really captivated, you can watch this video that Bella Figura created to take you through the entire process.